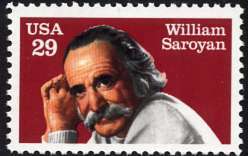 Twenty years after his death, William Saroyan is back in the news. His name pops up nearly every time a column by Herb Caen is reprinted – in Caen’s eyes, the Armenian-American writer epitomized the excitement of San Francisco. But Saroyan’s hometown of Fresno has also rediscovered its native son, devoting more than two months to a celebration of “Saroyan Festival 2002.” A portion of Saroyan’s ashes are buried in Fresno, beneath a black tombstone bearing the inscription, "In the time of your life, live – so that in that wondrous time you shall not add to the misery and sorrow of the world but shall smile to the infinite delight and mystery of it." But perhaps Saroyan never left the city about which he said, "San Francisco itself is art, above all literary art. Every block is a short story, every hill a novel. Every home a poem, every dweller within immortal." The following evaluation, which first appeared in the San Francisco Flier of May 30, 1996, won its author an award from the National Society of Newspaper Columnists. How, finally, do we assess William Saroyan? In his later years, as Saroyan must have sensed, the boisterous and voluble literary personage he had always cultivated wore thin, marking him in the eyes of many as a has-been struggling to maintain a daring-young-man effervescence long past its shelf life. Within that appraisal was often a sniggering which dismissed him as a minor talent whose work after World War II was egregiously self-absorbed and sentimental. 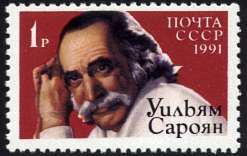 Saroyan's output from 1934 to 1940 established his reputation. What enthralled critics and readers was the brashness and certainty of his daring: Beginning with his first collection of linked short stories – written in 30 days, a story each day – and mailed off to Whit Burnett at Story Magazine. This was a new, fresh, exuberant kind of writing, intensely personal, prose poems which departed from customary narrative structures and sauntered elliptically with the awe of a young man fully realizing the most self-evident of truths: himself, alive upon the earth. This was Western writing, innovative and open, rich with landscapes and vistas, set against the dire backdrop of San Francisco at the height of the Depression. My recollection of those first Saroyan stories is typical: watching his language mesh the spiritual hunger and the actual physical hunger of the penniless main character was to be in the presence of a breathtaking act of creation. Hope and possibility were mandatory components to the human comedy as Saroyan viewed it. Accepting madness as the only constant in the universe never precluded joy and laughter. Cynicism had no place in the way one approached each day. Whimsy, compassion, a ready smile, and the gift of interior and exterior motion were to be the tools. These were the qualities for which the critics eventually deemed him a lightweight. What they lost sight of – and the cultural historians who will mine through Saroyan's papers and personal effects at Stanford have not – is that Saroyan's legacy is that of a unique regionalist, and specifically a Californian. His influence on the writers who have worked here subsequently is enormous. In hindsight, Saroyan's emergence onto the California literary plain was epochal. The tradition of 19th-century naturalism exemplified by Ambrose Bierce, Frank Norris, and Jack London was eclipsed by Saroyan's sensibilities. In San Francisco in the 1930s, a variant of that naturalist strain was prominent in the work of Dashiell Hammett, the city's then-foremost author. The dark, sinister cast of Hammett's world was challenged by the light, playful garrulousness and optimism of Saroyan. It presaged a new attitude which would prevail in the literature of the state and the region for the next six decades. I'm reminded of the incident in the early 1950s when a suddenly timorous Jack Kerouac reportedly met Saroyan and exclaimed, "So you're the man who wrote 'The Summer of the Beautiful White Horse.' I've never forgotten that story!" That meeting, one could suggest, was inevitable. All the ingredients the Beats would incorporate into their canon had a germinal precedent in Saroyan's work: Rexroth's and Ferlinghetti's recognition of San Francisco's cultural civility and bohemian possibilities; Kerouac's interior monologues, frenzied energy, and catch-all structureless narratives; and the Beat poets' looking toward the collected wisdom of Asia and its intermixed infusion of philosophical acceptance, respect for the earth, and simplicity of style. The wondrous California immigrant experience Saroyan detailed was a departure from the hardscrabble, menacing accounts of his literary predecessors. The notion of a welcoming new land open to individual experimentation was given a necessary new spin by Saroyan, an interpretation which proclaimed that a dazzling, lightsome place existed just over the horizon. It's this sense of a region of vast and dramatic perspectives existing in geological time – the "Voyald," Saroyan called it – which he has bequeathed to the writers who have since trekked west. In turn, those beholden to Saroyan left their mark on the next batch of literary emigrants. I once remarked to the uncommunicative Richard Brautigan that his work was awash with Saroyanesque capriciousness. (I intended it as a compliment and he took it as such, thanking me in three full sentences – two more than I had ever heard him utter in one sitting about anything.) It is difficult to conceive of the hippie phenomenon coming about without a Saroyan-like oeuvre as precursor, as well the cumulative ethos of the ecology movement demonstrated by poets like Gary Snyder. Moreover, what Saroyan added to the crucible of the writer defining his place upon the landscape was a remarkable insight into the creative process: Always walking the streets as if for the first time, noting nothing as insignificant and everything as meaningless, relishing the feel of the typewriter keyboard, crafting his words and himself as both a defiant and an absurd cackle at the universe. To our good fortune, unlike his California contemporaries Steinbeck and Robinson Jeffers (and John Muir before them), Saroyan brought the city into that field of vision, initiating the onset of San Francisco's literary renaissance. I phoned him for an interview 25 years ago for a piece I was writing. "Well, hel-lo there," he boomed, "and how the hell are you!" I later sent him a copy of the article, adding a postscript consistent with puerile admiration, to the effect that I hoped he would go on forever. Obviously he has, and I guess it's my turn to say so.